We grow a layer of high quality microcrystalline CVD Diamond on top of a high grade ceramic ball (Typically G5 tolerances). The coatings have a very good uniformity and are then polished to a very smooth/shiny surface resulting in an almost perfect sphere of the hardest known material. The hardness gives a very wear resistant and Surface with hugh improvents in wear resistance and lifetime of component. Another advantage of diamond is the inert surface. 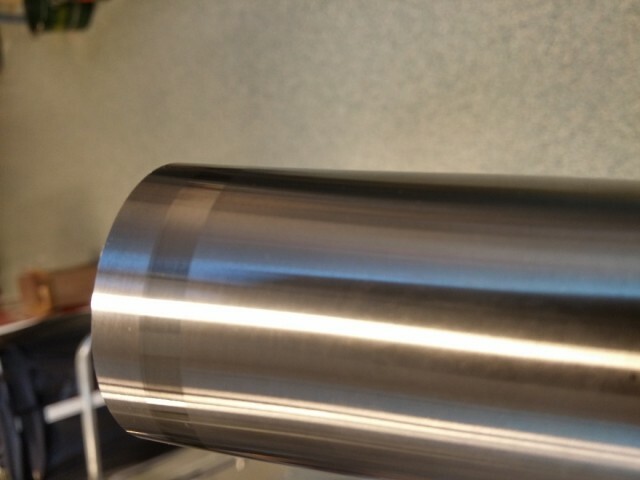 This is a great advantage in many applications like metrology and burnishing. Probes/Styli – hugh improved life time and significant less material pick up. We produce on request but also have some sizes in stock which we can deliver on short notice. Smooth Diamond coated balls with diameter from 1 to 12 mm. 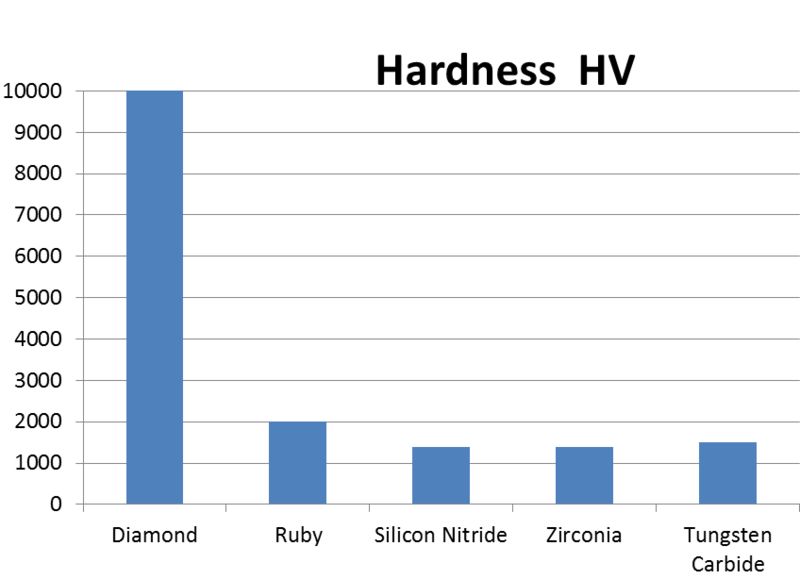 A Diamond coated Silicon Nitride ball was compared to an uncoated in a sliding test. The balls where sliding against a nitrided steel with a speed of 150 mm/s and normal force of 8N. After 6 minutes the Silicon nitride ball had a large wear mark. No wear could be detected on the Diamond coated ball. 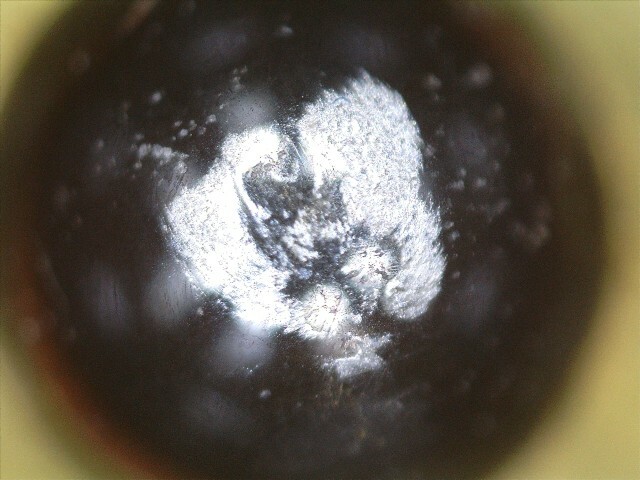 The test continued for 5 hours with the diamond coated ball and then a sligtly polished area could be detected (weak red ring around the wear mark). Still some of the roughness from the original Diamond Surface was seen indicating a polish of well below 50 nm. 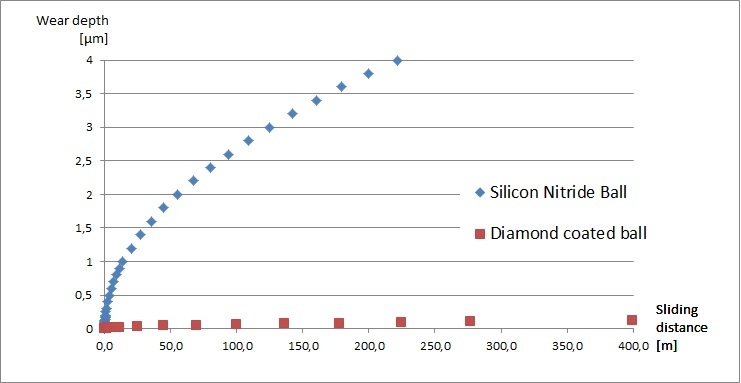 An attemt to estimate the wear rate showed that the ceramic Silicon Nitride ball was worn at least 2500 times as fast as the diamond surface. If a force of 0.1 N is used (Common) a probe quickly loses it’s tolerances and goes from a G5 to G10 after just 0.2 m of sliding distance. 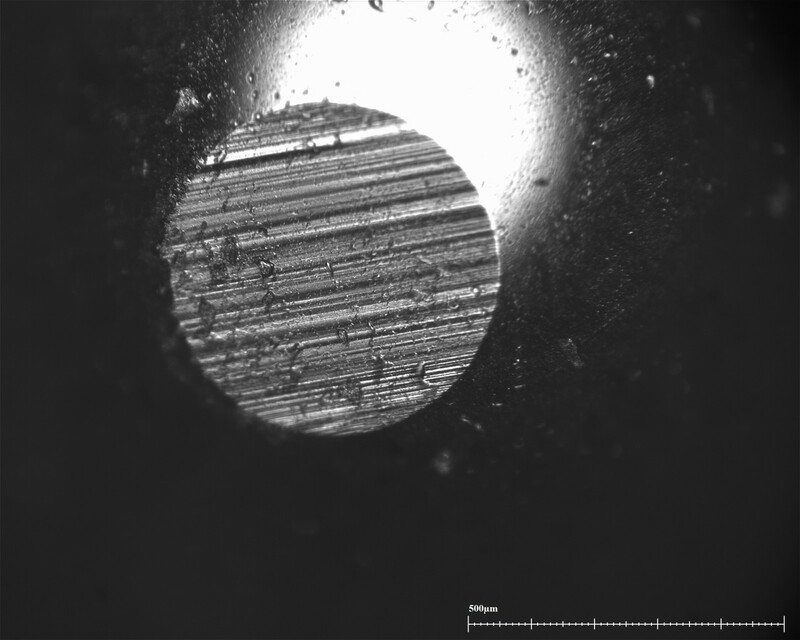 Wear mark on Silicon Nitride ball – 6 minutes sliding. The wear of a probe have a large influence on the performance of probingn applications. In the figure to the right are an example how fast the tolerances are lost (wear rate) on a spherical probe if its sliding on one position. 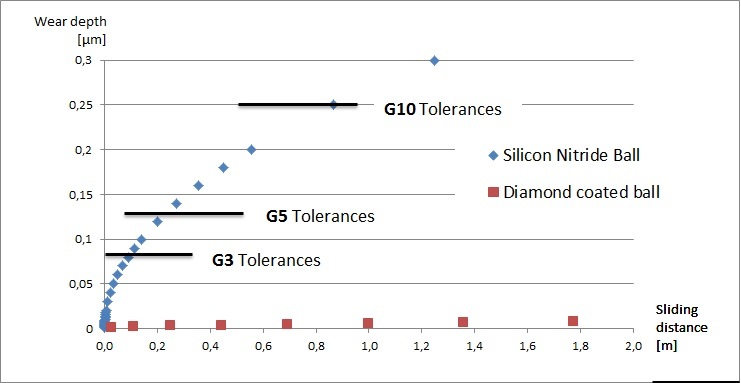 Already after a sliding distance of 0.9 m the wear correspond to an error of G10 (130 nm) tolerances. The diamond coated probe could slide 1700 m before showing the same error. If an error of 1 µm is acceptable the ceramic probe last 14 m and the diamond coated probe last 27000 m.
Wear depth of a 3 mm ball with and without Diamond coating. Not how fast the ball loses tolerances when sliding with a normal force of 0.1 N and a point load. Wear during longer sliding distances. The error due to wear will quickly be large and force replacements of the probe. The Diamond surface is extremely inert and does not pick upp material in Contact to other materials. A test where aSilicon Nitride ball was sliding against Aluminium showed that it easily pick upp/adhere material, see picture. 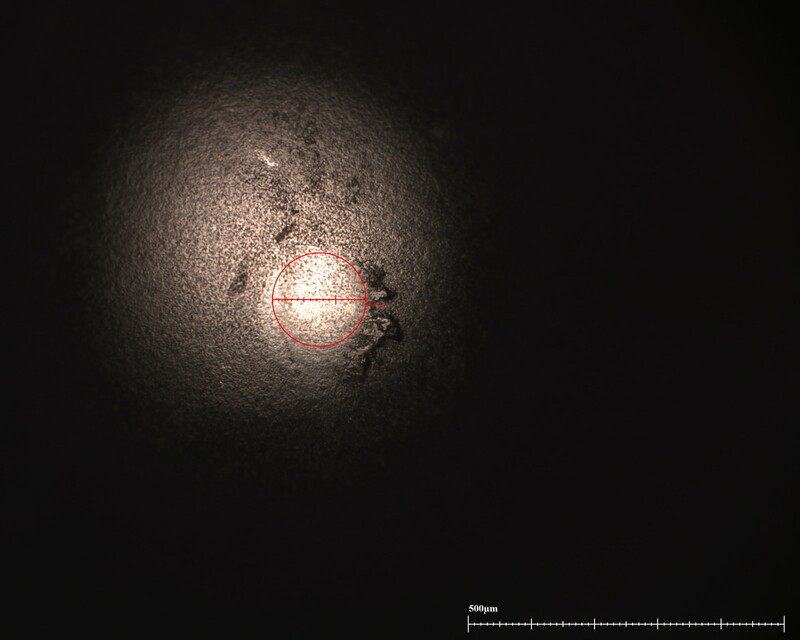 The same test with a Diamond surface showed extremely low amount of adhered material. 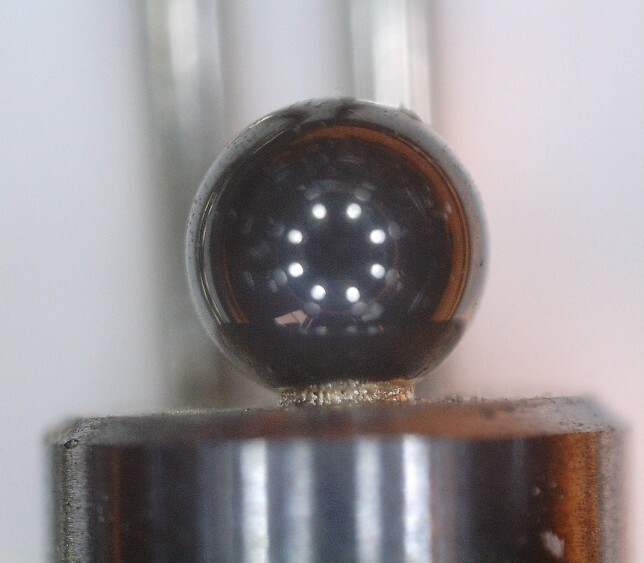 Diamond balls can be mounted by glue or vacuum brazing. A vacuum braze gives the best mechnical strength but is more complicated/costly. A simple gluing procedure with an Epoxy gives good mechanical strength. A 3 mm Ball on a 2 mm stem easily manage a 20 N load. Since the balls always have the same dimension they can be press fit in palce. This is a very rapid and low cost process. Burnishing can be very cost effective (Quick process) to reduce roughness and remove bad Ridges/roughness on the surface. It can be used on a part sliding against a rubber seal which favor a smooth surface or other applications. The Diamond ball gives an improved surface when pressed/sliding against a material. This is typically done on rods or tubes in the same set up as machining is done. As an example a ground axis was burnished with a diamond ball. There is a distinct difference between the ground surface and burnished surface which is easily felt with the Nail.